Bring a little bit of American Country charm into your home with these decorative Polystone rooster bookends. Each measures 6.5 in. H x 4.5 in. W x 4 in. D. This is a great quality item, a sure conversation piece and a thoughtful gift! Please allow 10 business days to ship. 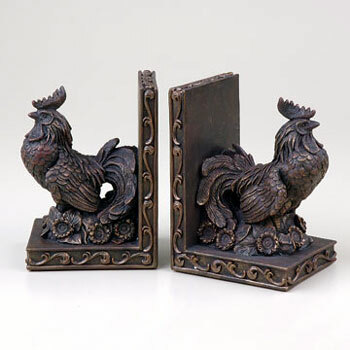 Set of two Country Rooster Bookends.